However, Sen. Richard Burr demonstrated today that Russian-funded ads were influential even though they weren’t expensive. He showed ads sponsored by two troll-backed Facebook pages, “Heart of Texas” which was liked by more than 250,000 people and “United Muslims of America” which was liked by more than 320,000 people, that promoted competing protests outside an Islamic center in Houston, Texas. The ads spurred a real-life protest. According to news reports, roughly a dozen anti-Muslim protesters and more than 50 counter-protesters heeded the call. “Establishing these two competing groups, paying for the ads and causing this disruptive event in Houston cost Russia about two hundred dollars,” Burr said. An intelligence community assessment released earlier this year stated that Russia conducted a widespread campaign designed to influence the 2016 election. But it didn’t act like a typical political campaign, at least on social media. Facebook’s general counsel Colin Stretch said that only about 25 percent of the ads were geographically targeted. While most of the scrutiny thus far has focused on Facebook and Twitter, and to a lesser extent on YouTube, other platforms were used too. Senator Mark Warner noted that there were 120,000 Instagram posts linked to Russia. “The data on Instagram is not as complete,” Stretch said, but noted that since October 2016, these posts reached more than 16 million people. Prior to October 2016, the posts reached at least 4 million, he added. 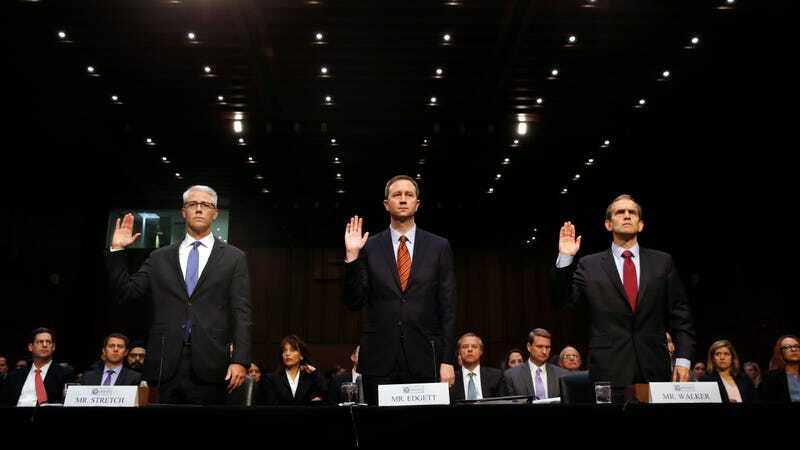 Facebook, Twitter, and Google representatives also testified yesterday at the Senate Judiciary Committee, and senators weren’t pleased with their performance—and the fact that the companies’ CEOs did not attend. “I’m disappointed that you’re here and not your CEOs, because we’re talking about policy and the policies of the companies,” Sen. Angus King remarked. Sen. Dianne Feinstein rebuked the tech companies over what she portrayed as an wholly insufficient response to significant national security threat. “What we’re talking about is the beginning of cyber warfare,” she said, promising that Congress had no intention of dropping the issue. If Google, Facebook and Twitter don’t step up their game, Feinstein said, Congress would step in to regulate them. “You’ve created these platforms and now they are being misused. And you have to be the ones to do something about it, or we will,” she said. A bipartisan group of senators has already introduced the Honest Ads Act to regulate online political advertising, and Feinstein’s comments indicate that the legislation might gain wider support. She said she is also working on her own legislation to require tech companies to report terrorist activity on their platforms to law enforcement. Although Senators displayed printouts of a few ads today, and other examples have appeared in various media outlets, we still haven’t seen a full list of this content. Facebook says it wants to leave the decision to release the ads up to Congress, and several senators have been outspoken about their desire to make them public. However, we got a hint today that several senators don’t want the ads to be released. “I think we have a disagreement on this committee as to whether or not to release those,” Sen. Martin Heinrich revealed.